Rosemary essential oil is a fragrant oil that is good for improving your brain function, enhancing memory, coping with stress, and relieving pain. The pleasant aroma of rosemary oil does wonders to boost your mood and enhance feelings of calm. Rosemary essential oil can also be used topically to promote hair growth, relieve muscle pain, and improve the appearance of your skin. Rosemary oil and rosemary extracts have been used for centuries due to their medicinal properties. Scientific research now backs up many of the therapeutic uses of rosemary essential oil. In fact, research has shown that rosemary oil contains high levels of powerful antioxidants. In this article, you will learn about the many rosemary oil uses and benefits for your health. You will also find out practical ways to use rosemary oil for its therapeutic benefits. Rosemary (botanical name Rosmarinus officinalis) is an evergreen herb that gives off a pleasant woody scent. Rosemary grows mainly in the Mediterranean region and is used as a food flavoring, meat preserver, and for its floral aroma in fragrances. Dried and fresh rosemary are used in culinary products and to make a refreshing rosemary tea. What Is Rosemary Oil (Rosemary Essential Oil)? Rosemary essential oil is made by a steam distillation process to extract the volatile oils from the leaves that contain all the health benefits. Rosemary essential oil is a very aromatic herb, and people describe rosemary scent as piney and woody scent. Some people say that rosemary oil has a slight citrusy aroma. In general, you should use 4-5 drops of rosemary essential oil for every tablespoon of carrier oil, or 10-12 drops for each 1 oz (30 ml) of carrier oil. The therapeutic compounds in rosemary make rosemary essential oil a popular oil in aromatherapy. Let’s look in more detail at the many rosemary oil uses and how you can use essential oil from rosemary to address many health concerns. Rosemary essential oil has a neuro-protective effect that can help protect your brain from degenerative conditions. Use a rosemary oil in a diffuser to help inhale rosemary scent and help support brain function and cognitive activity. Rosemary essential oil can help with memory loss because rosemary compounds inhibit brain chemicals that affect memory. Mix 3-4 drops of rosemary oil with a tablespoon of carrier oil such as virgin olive oil or sweet almond oil. Massage onto your temples and behind your ears to help strengthen your cognitive abilities. Find out what other herbs and foods you can take to help improve your memory and brain function. Another of the positive effects that rosemary essential oil has on your mind is that it helps resolve feelings of anxiety and stress. Further reading: The Best Essential Oils For Anxiety, Stress And Depression. Put a few drops of rosemary oil on a tissue and breathe deeply whenever you feel your stress levels rising. If you suffer from chronic stress and anxiety, find out what else you can use to lower your stress levels. Compounds in rosemary essential oil are powerful enough to kill off many strains of bacteria. This has potential use in helping to preserve food and also keep your skin healthy. Using rosemary herb in your cooking can give your food a wonderful taste and help kill off any bacteria. Later in the article, you can learn how to use rosemary essential oil for great-looking skin. Another of the many rosemary essential oil uses that boosts your health is that it helps reduce inflammation. Another study involving rats found that consuming rosemary essential oil or rosemary leaf extract has an anti-inflammatory effect on the gastrointestinal tract. 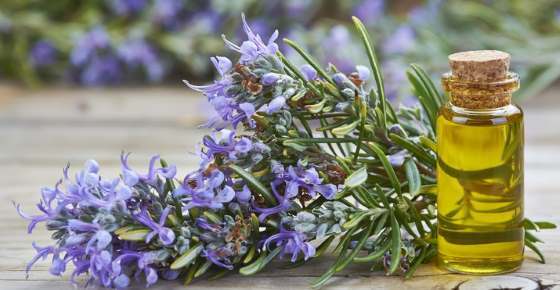 This has led scientists to suggest that rosemary can help manage inflammatory bowel diseases. (14) It is not advised to drink rosemary; however, researchers say that rosemary is among the herbs that are good for digestion and reducing flatulence. Learn about more natural remedies for IBS, reducing inflammation in your gut and improving your digestion. Rubbing some rosemary essential oil on your temples or forehead is a good way to clear headaches and migraines. To help get rid of a headache, you could gently massage rosemary oil mixed with a carrier oil on your temples for pain relief. Or, add 20 drops of rosemary essential oil diluted in a carrier oil to your warm bath and soak for 20 minutes to relax muscles, ease tension, and soothe away your headache. Learn about the top causes of headache and how to get rid of a headache quicker. The anti-inflammatory properties of rosemary essential oil along with its analgesic effect means that a rosemary massage oil can help alleviate painful joints and muscles. Mix 4 drops of rosemary oil with a tablespoon of carrier oil such as coconut oil. Use the rosemary massage oil 3 times a day on the affected area. Continue using the rosemary essential oil mix until the pain has gone. For more information on the best essential oils to soothe muscular pain, please see this article. Rosemary is one of the excellent essential oils for your skin because it reduces inflammation and helps keep your skin healthy. Pure rosemary essential oil is too potent to be used directly on your skin undiluted. Add 4 drops of rosemary essential oil to a tablespoon of sweet almond oil or other carrier oil. Put a few drops on your fingertips and massage the rosemary oil into your face, neck, and backs of your hands to moisturize and protect them. Avoid eye contact. Did you know that there are many other essential oils that help combat wrinkles? Use these essential oils such as rosemary to give your skin a more youthful appearance. One of the benefits of rosemary essential oil for your skin is that it has anti-acne properties. You can make a cleansing and refreshing skin toner for acne using rosemary oil. Mix 1 oz. of witch hazel with 5 drops of tea tree oil and 5 drops of rosemary essential oil. Use a cotton ball to cleanse your acne-prone skin with the rosemary skin toner. Learn about other essential oils such as tea tree oil that can help you win your battle with acne. Deeply inhaling rosemary essential oil can help reduce coughing, wheezing, and breathing difficulties associated with asthma. Fill a bowl with hot water and add 10 drops of rosemary oil. Put a towel over your heard and inhale the rosemary aromatic vapors for 10 minutes to help soothe coughing and respiratory irritation. Learn how to use rosemary for asthma and other respiratory conditions along with other essential oils. One of the promising uses of rosemary essential oil and its extracts is in treating various types of cancer. Although rosemary extracts can be useful in cancer treatment, more research needs to be done to explore ways to use rosemary to treat cancer. Rosemary essential oil is good for your scalp because rosemary oil can help hair regrow. For a daily massage to stimulate new hair growth, add 4-5 drops of rosemary oil to one tablespoon of carrier oil such as jojoba oil. Rub gently into the scalp for a few minutes and leave for at least 30 minutes. You can also combine it with peppermint essential oil (which can also promote hair growth). Further reading: How To Make Your Hair Grow Faster: The Best Natural Ways. Find out about other natural mosquito repellents you can use to keep yourself free from insect bites. Some people claim that rosemary will get rid of spiders from your home. Get some great natural spider repellent recipes in this article. This can be used, for example, in cases of Raynaud’s disease where blood vessels in your fingers and toes may overreact to cold temperature, leaving them cold and with skin discoloration. Rosemary essential oil is generally safe when applied to the skin diluted with a carrier oil. Rosemary oil in aromatherapy is also well tolerated by most people. Always dilute rosemary oil with a carrier oil, and do a spot test on your skin to make sure you don’t develop any skin reactions.